Technically speaking, Sportomatic was never a true automatic transmission. Unlike the later Tiptronic and PDK units, the four-speed (and later three-speed) gearbox didn’t shift between gears itself. Instead, the Sportomatic gearbox, introduced by Zuffenhausen in 1967 and based on the 905 unit, was an effectively clutch-less manual system that allowed the driver to change gear by simply pulling the gear lever through its standard H-pattern movement. In order to realise this, the gear lever featured a micro-switch that activated whenever the gear knob was depressed slightly. When the gear lever was touched, the switch caused a solenoid to open a pneumatic valve. In turn this causes a vacuum cylinder to disengage the clutch, allowing the syncromesh gears to be changed before the clutch is reengaged when the gear lever is released. Two pedals in a Porsche 911, first seen in 1967. 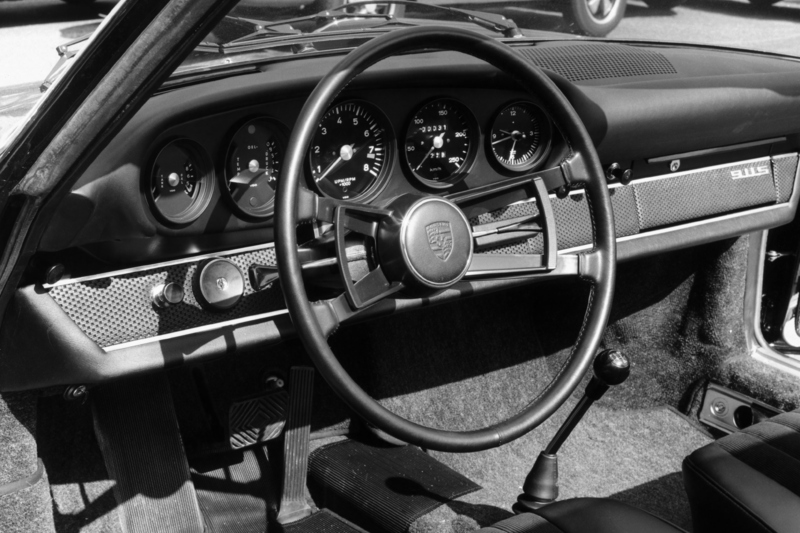 While this process still required driver input, the Sportomatic gearbox also featured a torque converter (something found in traditional automatic transmissions) in place of the manual 911’s flywheel. This allowed the car to come to a halt without the engine stalling or the driver having to physically engage neutral. Due to the torque converter, there was no mechanical connection between the engine and gearbox. Therefore, a ‘Park’ mode was added to lock the lay shaft when the car was parked. Confusingly, Sportomatic gears were labeled L, D, D3, and D4. L (‘Low’) was similar to a standard first manual ‘box’s first gear however, Porsche encouraged using D to pull away unless on a steep incline or inclement weather. ‘D’ and ‘D3’ (note no ‘D2’) were slightly shorter ratios than second and third in a standard unit, however ‘D3’ was slightly longer, acting as an overdrive. 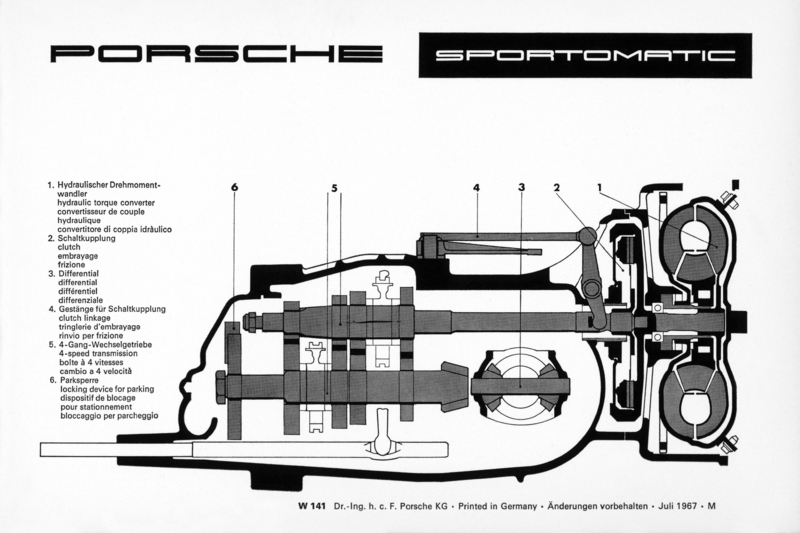 The torque converter, which shared the engine’s oil supply (increasing the total oil capacity by 2.3 litres) also served as a torque multiplier, allowing Sportomatic 911s to pull away in any of their four gears. Thanks to its ostensibly manual operation, the Sportomatic gearbox wasn’t the first automatic transmission to feature in a 911. That honour falls to Tiptronic.